For our posting this week, the spot-lights are focused on the hot convertible Mercedes Benz E300 AMG Coupe. The deeply impressive Mercedes E-Class Cabriolet has just arrived at Revol Carz Makeover workshop for a premium grooming session that includes the special treatment with our award-winning, ZeTough Ceramic Paint Protection Coating. The design and build of the E-Class AMG Coupe has a striking front section with a low-positioned diamond radiator grille and a centrally located Mercedes Star, LED Performance headlamps and a drawn-out bonnet that underlines the more dynamic look of the new generation model. The fabric soft top can be fully opened and closed in twenty seconds when travelling at a speed of up to 50 km/h. The roof multi-layered structure with high-tech insulation reduces wind and noises. It folds down into a bespoke compartment in the boot and a retractable cover separates the soft top from the remaining boot space. The cabin is superb with more premium feel bragging of brushed Elmwood trim, aluminum and leather lined dash. 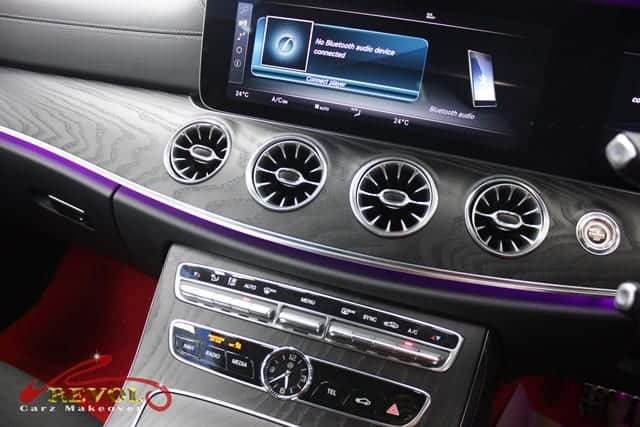 Stretched across the dashboard are two definition 12.3-inch screens, one for the instruments and one for the infotainment system. Sixty-four colors of ambient interior lighting let you suit your mood. Under the elongated bonnet lies a 1,991cc twin-turbocharged four-cylinder petrol engine which produces a whopping 241-bhp and 370Nm of torque. Power is sent through a precise 9G-Tronic gearbox which allows the E300 AMG to smash the century sprint in just 6.4 seconds. We invite you to hop in the E300 AMG and be our VIP (Very Impressed Passenger) as we take you on a drive through showing you how we transformed the new 2018 Mercedes Benz E300 AMG Convertible to a breath-taking showroom condition. Welcome to the fascinating world! The E-Class AMG Convertible is simply stunning after Revol’s grooming with treatment of ZeTough Ceramic Paint Protection Coating. The gleaming polished front section with diamond radiator grille, a centrally located Star, LED Performance headlamps and a drawn-out bonnet underline the more dynamic look of the new generation model. The active LED headlamps were passionately polished by hands for the final crystal-clear showroom looks. 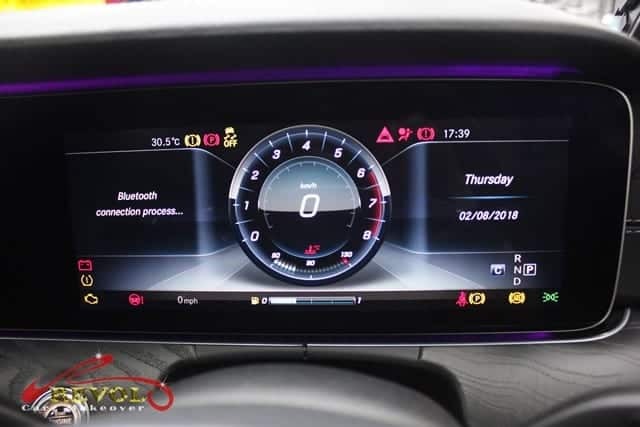 The infotainment system is operational on the steering wheel or a rotary dial controller and a touchpad on the centre console. A super-clean 12.3-inch digital instrument cluster is an added pleasure for driver. 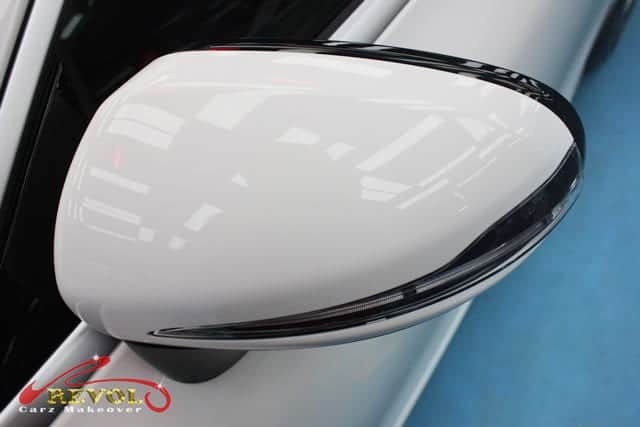 We brought the wing-mirror a little closer for our viewers to awe at the deep gloss created by ZeTough Ceramic Paint Protection Coating. Finger nails and ring scratches around the door handles? No problem. These will not recur with the coating of ZeTough Ceramic Paint Protection’s glass-hard coating. The three layers, four seasons acoustic soft top is richly tailored with rich heavy-duty fabric. Push a button and it vanishes into the automatic partitioned trunk is under 20 secons. The powerful rear end now sporting smarter LED tail-lamps and wide ‘effect rear’ bumper is more eye-catching after the treatment of ZeTough Ceramic Paint Protection Coating. 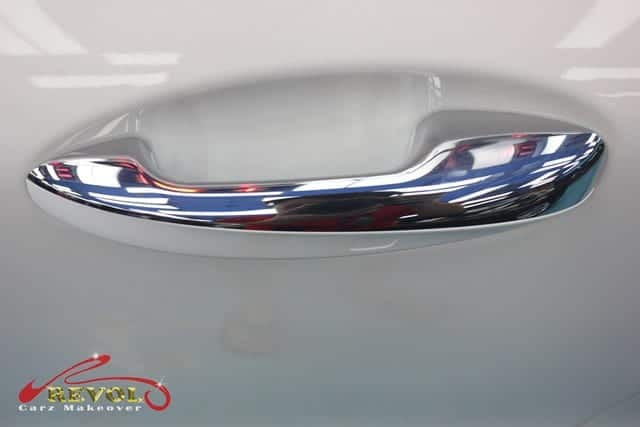 For that ultimate showroom finish, we ensure that the chromed exhaust pipes are cleaned and polished to perfection. 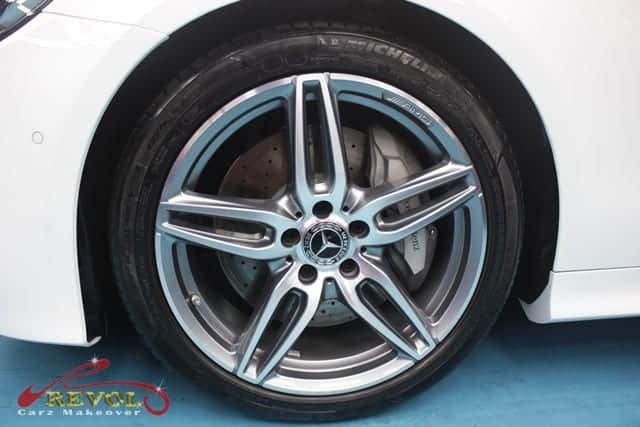 The 18″ AMG 5-Twin-spoke alloy wheels in Tremolite grey with burnished finish were gently dismantled restored and polished for the ultimate showroom-looks. The pride and reward for our dedicated detailers are achieving a super-clean engine bay to the satisfaction of our customers. 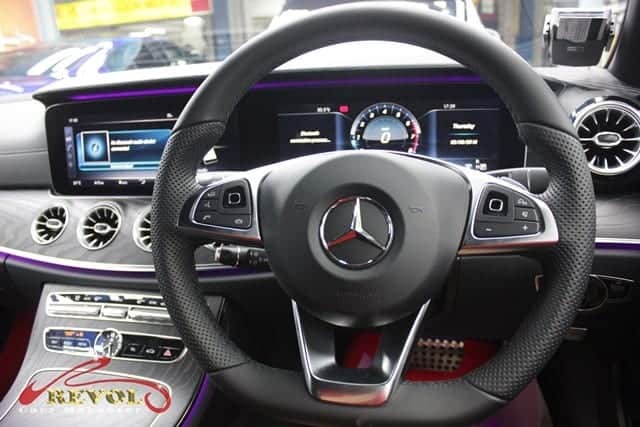 The 2.0-litre twin-turbocharged four-cylinder petrol engine generates an impressive 241-bhp and 370Nm of torque which allows the E300 AMG to smash the century sprint in just 6.4 seconds. 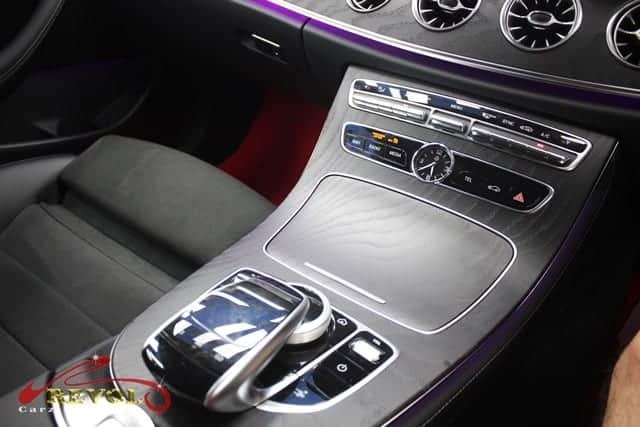 Our trained detailers left no stone unturned in meeting the high-standard of a super-clean and sanitized interior. All leathers are treated and nourished with eco-friendly cleaners and conditioners for a longer term protection. DYNAMIC SELECT dials in the car’s performance character with the tap of a console button. The cleaned and polished “floating” widescreen cockpit COMMAND display allows pleasurable viewing and easy toggle. Nothing gives us more inspiration than putting a smile on our satisfied customers’ faces when they awe-stricken by their own cars after the incredible makeover. Thanks to the treatment with ZeTough Ceramic Paint Protection Coating. 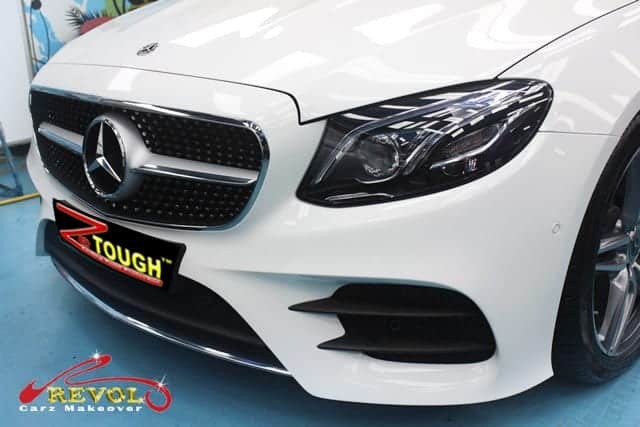 After Revol’s professional makeover, the Mercedes E400 AMG boasts of a much brighter shine than any car in showroom condition. ZeTough’s incredibly long lasting protective luster promises to give the paintwork a lifetime protection.